Netflix Review - "Holy Rollers"
Sam Gold (Jesse Eisenberg) is a young man whose life is run by his Orthodox Hasidic Jewish upbringing. He lives at home, works for his father, and will marry only the woman he is set up with. Everything changes, however, when he accepts a job offer from Yosef (Justin Bartha), his best friend's older brother who serves as the community's black sheep. Presented as a free trip to Amsterdam, Sam quickly discovers that to return home, he will have to carry Ecstasy through customs. While he is clearly shaken by this foray into the world of drug running, he quickly realizes what kind of financial benefit this trade could bring him. He begins training other down-on-their-luck Jews to smuggle drugs and before long, asserts himself as a valuable part of kingpin Jackie Solomon's (Danny A. Abeckaser). But as the deals get bigger, Sam's family life falls apart and he comes closer and closer to the edge as the feds get closer. "Rollers" gets some good-enough performances from the cast. Eisenberg brings a certain emotional attachment to the project and does an admirable job of making Sam his own man instead of a Mark Zuckerberg as a drug mule. Bartha, usually the comic relief, plays well against-type and embraces the black sheep junkie with flair. Based on real events, the film's setting is interesting but fails to develop as I would have liked. There's a great story to be told within the framework of the "Orthodox Jew struggles with the abandonment of his family and faith in order to make good money" plot line. Unfortunately, director Kevin Asch and screenwriter Antonio Macia neglect this, the most intriguing aspect of the tale and instead focus on a cookie-cutter love triangle that stagnates the flow of the film and brought about boredom on my part. 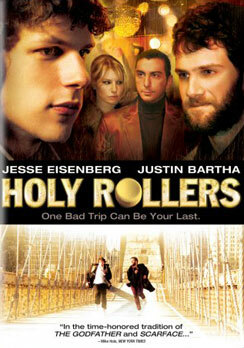 A refocused narrative could have made "Holy Rollers" an engrossing film. Instead, the final product is mediocre at best.